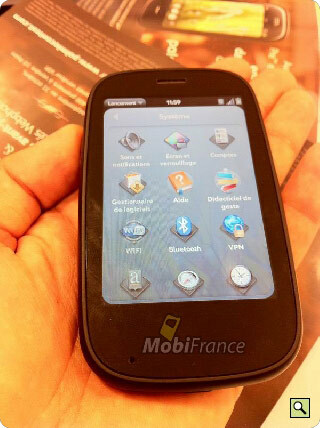 Following up just a day after the Palm Pre 2 SFR leak, another French website is chiming in with details and the first set of spy-shots of the supposed Pre 2. MobiFrance has published an article on the Pre 2 that confirms a few specifications and includes a number of pictures of the device. The set of images confirm that the overall design is much the same with a few minor casing tweaks such as a flatter face, some kind of soft touch display bezel and an exposed side microUSB port sans the flimsy cover. 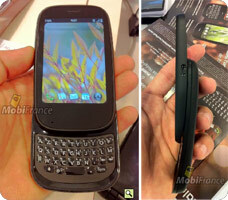 Spec wise, the unannounced handset is confirmed to be running webOS 2.0 on a 1 GHz chip with 512 MB of ram. Still unconfined at this point is the screen resolution, which judging from the out of focus spy shots seems to be unchanged. Still no definitive word on release timing, though MobiFrance seems to think it will arrive sometime in November. Not a game changer, but improved hardware and spec bumps (1Ghz processor and 512Mb RAM) is what everybody has been calling for.. what did you expect? Add in webOS 2.0 and I think as long as the pricing is right then it should sell fine. According to the french website the pre2 has a bigger flatter screen. Will be interested to see how the resolution on that adds up. I have a feeling that this is an interim phone and that we won't see the fruits of the HP takeover til next year. I might actually take a punt on this one if the price is right. yes - once again - the *real* game changer is *coming*. you've been waiting how many years now? why? and at what point do you start feeling like a chump? Well, now all it's doing is coming with the guts it should have originally launched with. A flatter face is no innovation. I don't recall anyone complaining about the curve of the face. It was the curve of the slider that elicited squawks. This is still not something I'd buy. I hope they don't plan a big production run for this. not sure if the curve helps or hinders the target demographic. >This is still not something I'd buy. F*****g Shiva handed you a million dollars, told you "Sign the deal!" you wouldn't sign. And the god Vishnu too, into the bargain. That's what excites you these days? X-ray pr0n? Hello this is Sam from Dell. Hold on for a minute. You should not be using my Gods names in vain. That is most sacrilegious. Did you honestly expect them to not have an upgrade to the Pre? Give me a break. Apple is hailed for the slow methodical and incremental improvements they make to their product line. This is a solid upgrade to the Pre which is all anyone could have realistically expected. Product pipelines, even for cell phones, are measured in terms closer to years than weeks. Development of this phone probably started before the first Pre was sold. Removing that god awful curved shiny distorted reflective display is a big step in the right direction! That azerty keyboard just highlights the advantage of software keyboards, an iPhone has over 40 to choose from. When they include legacy app compatibility they may have a contender. The thing is, the first version of the Pre was, on sum, a failure. So a Pre 2 which is basically the same thing with incremental upgrades is asking for trouble. what's the definition of insanity? doing the same thing twice and expecting different results. So what constitutes a home run? The specs are equal to the majority of competitors... while there are a handful of phones with better specs, ie front facing camera for video calls and bigger or higher resolution screens (resolution still to be confirmed on Pre2), the main differentiating factor is the OS. In this regard webOS is competitive now that the hardware is up to spec. WebOS is one of the most easiest, most pleasing to use UIs out there.... I would suggest you actually try it on an overclocked Pre to get a real idea of what the new Pre2 will be able to do. For the record I have an iphone 3GS, but after playing around with the latest Android, iphone4 and a friends overclocked Palm Pre, I feel I know which direction I want to jump to next. No, the Pre was not failure, the Kin was a failure. Because of new better/faster competition the Pre was not a home run. It was an average run-of-the-mill single. Trying not to sound like a jerk, but this ain't gonna happen, legacy app compatibility. Every os known to man has abandoned its previous apps. Sorry. Just came to me, isn't this in keeping with the engineering principle of KISS? Along the same line would it not be considered refinement which someone has already mentioned? Except for the first Palm this company has not been known for innovation which has also been stated here possibly a million times. That new processor would take care of my only complaint that comes to mind, while watching the rescue of the miners. God bless them all. No, if Apple would have pulled a stunt like that with iPhone they wouldn't be where they are now. >>>No, if Apple would have pulled a stunt like that with iPhone they wouldn't be where they are now. Attention! Apple DID pull a "stunt" like that, when they went to OS X. Bringing iPhone into this is nonsense. It's still iOS, and older versions can't use all the software of newer versions (hello, no compass, for one thing). I wonder if they saw fit to improve the miserable camera of the original Pre? No compass on older iPhones is due to a lack of appropriate hardware, IIRC. Please correct me if I am wrong. The original Pre camera wasn't hideous. It was fixed focus, yes, and "only" 3mp but at least it was lightning-fast unlike some of the laaaaaaagy Android competition. I think the unforgivable lack of video recording at launch was a much bigger problem. I want to see a major focus from all handset & camera sensor module manufacturers on better response and performance instead of just upping megapixel counts. Mike, you compare updating the OS to handle hardware improvements to dumping the OS that you are known for and your entire developer base! That's the ignorant think that killed Palm. You're right on track Kris, Apple spends less time worrying about pixel count and concentrates on picture quality. The backlit technology does a lot more to improve photos than pixel count. The company ended up having to be sold. That counts as a failure. The problem is a phone that is just a bit better than everyone else's isn't going to sell well. It needs to be able to distinguish itself by more than a few better columns in the specs and a slightly better user interface. People have already looked at the Pre and passed on it. What are they offering so people look again? The Motorola Droid (the original one that came out last Nov) is the most recent example I can think of off the top of my head of an absolute smashing success + save-the-company sort of Hail Mary product. In times past, that title could've belonged to Palm in the Centro and Treo 600/650 days or to Apple in the time of the original iMac. The Pre wasn't a success on the Droid or iPhone level but it was not an epic fail on the level of the Kin. It would have been fine as an interim device for a larger company but it wasn't enough to save Palm given the state of the company's finances, marketshare and mindshare. Again, there is no reason the Pre 2 couldn't have been released earlier in the year but now it will at least help keep WebOS and HP/Palm in the spotlight to a certain extent while more compelling hardware is developed. I guess the thought that's dogging me is how close the Pre was to looking like a Droid-level hit when it was first announced. The software side had a quality that is nearly impossible to obtain--it not only looked different, it looked *better. * The whole card metaphor seemed so obvious and intuitive that, on first glance, it made the iPhone UI seem clunky and under-thought. The reality, not so much. I think there's a lot of Monday morning quarterbacking going on here. The Pre wasn't a failure in any sense of the word. It had boatloads of buzz coming out of CES, and even when it was released, it sold decently at first. It wasn't selling on iPhone levels, but it was doing okay. What killed Palm wasn't the lack of success with the release. What killed them was the lack of follow-up. They had what was widely acknowledged as a good phone, but they fumbled with the software side of things. They announced a slew of software partners, but didn't follow up quickly enough (or sometimes at all (e.g., DataViz)) with software releases. That's what killed the Palm joy. Frankly, I don't know that there's anything HP can do about that now, short of figuring out a way to emulate iOS or Android apps in WebOS. 34, see in profile your latest device is T5. You still using it. I still have mine in box, but don't use it. I thought it was a kickass device when it came on the scene. I thought that usb drive was the cats meow. I agree with you about the T5, though. It was a solid device. I liked my TX a little bit better, but still, the T5 was nice. And to correct my last post a little bit: I don't think the lack of follow-up with other vendors was necessarily the worst mistake they made. The worst mistake was not making sure they made every possible deal they had to make to ensure that Classic was installed -- for free -- on every shipping Pre and Pixi. Yes, most of the apps were crude by today's standards, but at least they would've had a solid stock of apps to point to. Initially, I was one of the people thinking they shouldn't have to include backward compatibility, but that was before I saw how mind-bogglingly bad they were at pumping out apps. the T5 was a piece of garbage. i remember (as some of you might recall) driving all the way to my local (now defunct) Palm store at the airport upon its release and fighting and schmoozing the TSA in a post-9-11 world in order to get through security with no ticket in order to get my hands on one. bought it and drove all the way home only to soon realize that it was a piece of garbage. then had to repeat said process to return the damn thing and revert back to my then-beloved T3 . what an awful device and an awful experience. i think this was around 2004? hard to believe it's been 6 years and now i have something so much more powerful and amazing like my EVO 4G! Could you be a little more descriptive than "piece of garbage"? When I had it, it was a pretty solid device. It wasn't a phone, and it wasn't terribly net-connected, but it was a good PDA. I only dumped it to get the TX's wi-fi. 1. cheap plasticky build quality. funny - just like the Pre - i guess some things never change! 2. buggy beta rollout of NVFS storage system. 3. no WIFI (standard on many PDAs at the time). there's probably more but i just can't remember. 1. Ditto. Giving their flagship (at the time) device the same lame formfactor as their midrange, already dated T|E--unforgivable! 2. Yes, but at least the T5 had extra RAM to spare. Remember how crippled the 650 was at launch? In some instances, pre-patch, it had LESS usable space than the device it was replacing (Treo 600)! 3. Horrible move on Palm's part, but somewhat understandable given the presence of the T|C in the lineup. Still, people had been clamoring for wi-fi on the T3 a year earlier. 5. Not really. The Athena universal connector was used from the T5/650 in 2004 up through the final Centro in 2008. MiniUSB and such hadn't really caught on at this time so that is somewhat understandable. 6. Another lame move considering the T5's predecessors had always included cradles. 10. Worse stylus than the T3. Also required unscrewing the cap to access the reset button. PIC has effectively turned into a nostalgia site. not through any fault of Ryan - but from a failure of Palm to create and market credible, competitive products. The Pre Plus was what the launch Pre should have been. Ane this Pre 2 should really have come out 6-9 months ago in order to be truly competitive. That said, it's now a solid alternative to the BB Torch and maybe to the Droid Pro but the highend will still continue to be dominated by large-screen candybar slabs. .
-Virtual keyboard support might be there for WebOS 2.0 but it will be all but useless on that tiny screen and will still be awkward on a portrait slider. well the beauty is that HP has almost unlimited financial resources (sans talent and leadership) to keep throwing this shiit against the wall ad infinitum (and ad nauseum). eventually they'll probably wise up and fully embrace Android and shut webOS down. p.s. i predict that Apotheker will soon run HP back into the ground and after several abysmal quarters his head will roll along and all unprofitable unsuccessful "ventures" like Palm and webOS will be shut down. when times are good - everyone is fat and happy and there's a lot of margin for error. when times are bad - everyone starts pointing the finger at everyone else and they start looking under every rock to cut costs and trim fat. Gekko, "when times are hard".... so what do you call the economy in its current state? Wish you would stick to the topic and not meander off into your personal desire for revenge on Palm for not getting you the Palm PDA/phone you wanted... The current company is nothing to do with the days of Colligan. This is a new company with a new direction, the only thing that should matter is whether webOS is a competitive mobile OS in the smartphone/tablet arena. For me the answer is now starting to look like a yes now that the hardware specs and underlying OS is starting to mature with 2.0.
try to follow along - companies can prosper in bad economies - ie see Apple - and vice versa. i was talking about HP recent success under Hurd as defined by market share and stock price. the bottom line is that i just don't think HP/Palm can compete with the iPhone and Android juggernaut - let alone WP7 and BB. someday iPhone and Android will die - but i think they will be done in by some dropout who started a company out of his dorm room. Will HP CEO Leo Apotheker Kill Palm's Consumer Future? I'm hoping HP's new CEO, Leo Apotheker, has a scintillating personality, because his resume looks like doom for the world's largest computer maker's future in the consumer and mobile markets. I'm not baffled by this choice: I'm depressed. On paper, Apotheker is an apparatchik from a company that has absolutely no exposure to consumers. He spent 20 years selling hideously boring but profitable enterprise software, and was then vaulted up to CEO and swiftly sacrificed on the altar of the global economic collapse.